Apple will continue to include a Lightning to 3.5mm Headphone Jack Adapter with the trio of new iPhone models rumored to launch later this year, according to Barclays. "We believe it stays this year but goes away at some point, potentially in the 2018 model," said Barclays analyst Blayne Curtis, and his associates, in a research note distributed today. Cirrus Logic would remain the primary beneficiary within Apple's supply chain, as it's believed to provide some of the tiny audio-related components inside of the adapter. Barclays contradicts Japanese blog Mac Otakara, which said Apple will no longer include the adapter in the box with the so-called iPhone 7s, iPhone 7s Plus, and iPhone Edition. Apple eliminating the 3.5mm headphone jack on the iPhone 7 was a controversial decision, so it's easy to see why it might want to include the adapter in the box for at least another year. But, unlike when that iPhone launched last year, Apple's wireless AirPods and BeatsX earphones are now available. 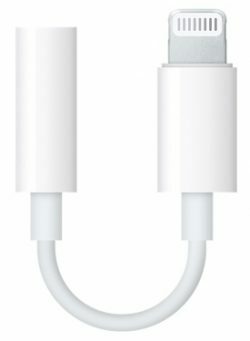 Apple sells the Lightning to 3.5mm Headphone Jack Adapter for $9 as a standalone accessory, which is cheap by its standards, so customers that still prefer to use wired headphones won't be forced to pay too much extra whether the adapter is removed from the iPhone box this year or later. But he's not, so let's stop bringing this hypothetical into every thread. That’s nice, but we don’t all want wireless headphones. I prefer wired headphones because they have better price/performance and reliability. You don’t have to worry if your wired headphones need to be charged or how long their batteries will last. Apple’s AirPods are nice, but are overpriced for how they sound; they sound the same as $30 EarPods, while costing $160 - a 530% markup just for wireless! I wish they'd extend that generosity toward new MacBook Pro buyers, we need adapters too. Or even better: Build in more ports so those adapters aren’t necessary. USB-A, Ethernet, Magsafe, SD card adapter. Or, you know, don't drop industry standards for your own proprietary connector that adds zero value to your product AND then continue to sell your iPads/iPods/Macs with a headphone plug. Having said that, it seems this hasn't been anywhere near the life ending issue that MacRumors and readers made it out to be, before the release of the iPhone 7. It's still the best selling iPhone ever and people seem to be coping with loss of the headphone jack without issue. No there's issues... but people just roll with it because "the rest" keeps them clinging to iPhone instead of rejecting the entire product because the hassles of a decision regarding this one part. Of course, it's not "life ending"- just an added nuisance ... for no significant tangible gain for us consumers. Apple got something(s) out of it- internal space or perhaps lower unit costs & a high-profit accessory to sell. What did we consumers get out of it? Another piece of hardware to have to keep in the bag just in case we need it. I don't know about everyone else but being an Apple consumer seems to now mean needing more and more accessories in the bag. I don't think "thinner & lighter" makes sense if one pretty much needs to carry some other stuff to make the latest "just work" as readily as it used to work when such functionality was built inside. For all the pro-Bluetooth or even pro-Lightning connection arguments, all iPhones ALREADY offered BOTH of those options. If they were more appealing to those who will argue so hard for them, all such people could readily go that way without any hinderance. If they were genuinely better than 3.5mm, the masses would migrate for genuinely better too (contrary to popular spin, people don't have to be forced to embrace genuinely better if they can see (or hear) that it is genuinely better). What this did do is remove something useful and thoroughly ubiquitous that "just works" with pretty much anything & everything and shift to a fragmented mix of options involving adapters or trying to embrace either alternative but make that work everywhere else one wants to use such alternatives or just carry along adapters plus TWO sets of headphones/buds everywhere one goes to be ready for any scenario. Even the ready ability to use any type of phones/buds between iPhone and Apple's own Macs is complicated unless one chooses the Bluetooth option, which then fails when trying to enjoy the easy connections to all kinds of other audio stuff without Bluetooth. We Apple people used to ridicule competitors on their forced fragmentation decisions, but now that Apple has made choices to do it, we spin it as positively as we can... every chance we get. And "best selling" arguments don't really prove such points. It just proves that consumers want "the rest" enough to put up with such aggravations. That works just fine... until it doesn't. Should Apple decide to eject the camera or battery out to an accessory, they might be able to get away with that too. But eventually, there is the proverbial straw that makes people give up. Look through most threads here- especially Mac threads- and you see admissions of "always Apple until..." people who reached their brand loyalty breaking point because Apple did or didn't do something to meet such users wants or needs. Apple is not forever immune to such brand defections... no matter how much some of us will spin that any such decision that disappoints chunks of the Apple consumer base proved inconsequential because Apple keeps rolling in the dollars. Sony, Palm, Blackberry and countless others used to have best-sellers beating their best-sellers year after year. And then their customers tired of seemingly out-of-touch or losing-touch corporate decisions and migrated to something more connected to their wants & needs. Record revenues & profits are not automatic and guaranteed but earned... and part of earning them is not losing too much touch with the source of the money. Blackberry once had such a passionate following, their product was referred to as crackberry. Where did all of those crack-heads go and why? I still wish the 7 had a standard headphone jack. It's happened many times where I have to choose between listening to something on my phone and charging it. I end up just draining that battery down to the bottom before plugging it in. What makes it worse are those fake speaker holes that replaced it, staring me in the eyes when I plug it in to charge it. Considering Tim Cook’s decisions of the last few years, I think Steve was wrong when he told Apple employees (Cook included) to not ask “What would Steve do?”.